Download the VMware View Client. Launch the VMware View Client and install the file. Note Administrator access may be required. Copy the VMware View Client application file to the Applications folder. Download the VMware Horizon Windows Client. Launch the VMware-viewclient installation file. Select I accept the terms in the license agreement and then click Next. Keep the default setting selections and click Next. Note Click Browse to install the applicatin in a different location. Type midesktop.umich.edu in the Default View Connection Server field and then click Next. Adjust the default behavior, if neccessary, and then click Next. Select where to install shortcuts, if any, and then click Next. Note You may need to restart your computer before using VMware View Client. Related To change your UMROOT password and match it with your UMICH password, see Choosing and Changing a Safe and Secure UMICH Password. Enter your uniqname and UMROOT (Windows Active Directory) password and then click Login. Note If the Domain field is blank, select UMROOT from the drop-down list. Double-click a virtual desktop to connect. Note Current Mac clients no longer support the RDP protocol. 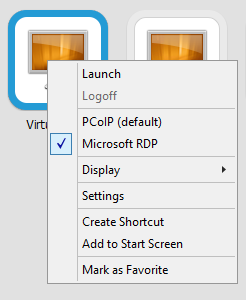 To change the default protocol in the Windows client or for more advanced options, right-click the virtual desktop icon. Go to the VMware Horizon launch page. Double-click VMware Horizon HTML Access. Log in with your uniqname and UMROOT (Windows Active Directory) password. Once connected, your virtual desktop behaves the same as a traditional computer.